On Sunday 22 April 2018 Britten Sinfonia alongside The Sixteen and conductor Harry Christophers will give the Vatican premiere performance of Sir James MacMillan’s Stabat Mater. 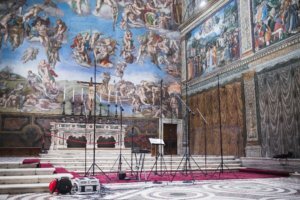 Audiences from across the world will be able to watch the concert from the Sistine Chapel as it becomes the first ever concert live-streamed from the Vatican via ClassicFM. The critically acclaimed Stabat mater, was commissioned by the Genesis Foundation for Harry Christophers and The Sixteen and received its premiere in 2017.